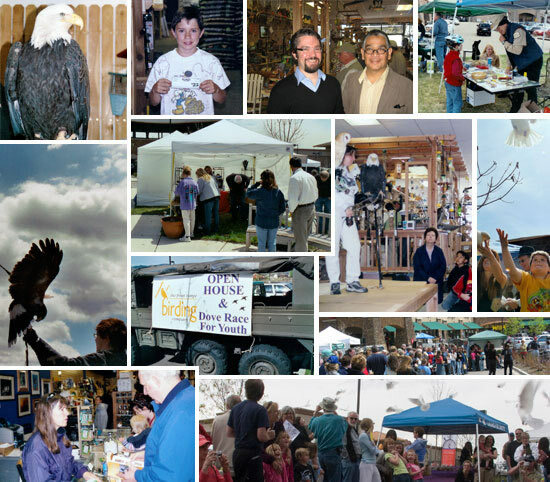 OPEN HOUSE AND FRBC BIRDING FESTIVAL FEATURES HAWKQUEST, RAFFLE, AND ARTS AND CRAFTS FAIR ON SATURDAY May 12, 2018 FROM 9AM UNTIL 5PM. The Front Range Birding Company celebrates International Migratory Bird Day on May 12 this year. A full day of fun and events will take place at the Sagewood II Shopping Center, 10107 West San Juan Way, Suite 110 Littleton, CO 80127 (near the NW corner of Kipling and C-470 beside Texas Road House) from 9 am till 5 pm. The raptor conservation group, HawkQuest, is a featured attraction from 11 to 5 as they present a live Bald Eagle, Great Horned Owl, Peregrine Falcon, and Harris’s Hawk for display. 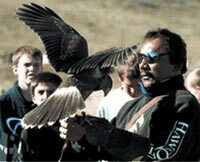 You will be able to get up close and personal with each of these exquisite birds of prey. Their expert trainers will actually fly a Harris’s Hawk outdoors for all to see at 1 pm. All during the day local artists will have their wares available at an outdoor crafts fair. It will be a great opportunity to find that perfect unique, handmade gift for Mothers Day, Fathers Day, or Graduation. In addition, local park rangers, CO Parks and Wildlife officials, and the Audubon Society of Greater Denver will man educational booths. 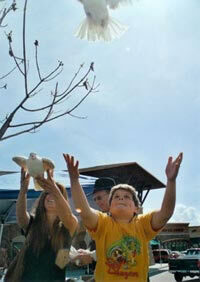 Together they offer interesting and intriguing nature programs for both adults and children to enjoy. The event also honors our community’s First Responder heroes. From Noon to 3 pm the West Metro Fire Department will attend with their huge Fire Truck. You will have the first rate opportunity to meet and greet our Denver firemen in person and thank them for their service. For a small contribution to The Jason Dahl Scholarship Foundation individuals can participate in a great raffle for a $500 Spotting Scope/Tripod combo donated by The Front Range Birding Company. This year a silent auction for the charity will also take place. The top auction item is a 1 hour jet airliner simulator ride and tour at United Airlines Flight Training Center! We also have Club Level Broncos tickets and great first base line Rockies tickets available in the auction. Jason Dahl was the Captain of United Flight 93 on 9/11/2001. Jason was a Littleton/Ken-Caryl resident and an outstanding member of our local community. His story is well known for the brave acts he performed that fateful day almost 16 years ago. The foundation named for him raises money for scholarships at Denver’s Metro State. This is the 14th year of the Front Range Birding Company Open House and an average of over $10,000 has been raised annually, all of which directly supports The Captain Jason Dahl Scholarship Fund. It is a blast to support the community and such a worthy non-profit organization. Learn more about the Dahl Fund by visiting www.dahlfund.org. Come on out to the open house and enjoy all the festivities. Big discounts on food and beverages will be available at participating restaurants in the shopping center. Live bluegrass music will be on tap in the morning and afternoon. It promises to be a blast for the entire family! 11 a.m. – 5 p.m. HawkQuest!